Metal roofing is everywhere you look today, from colorful canopies and mansards on hotels and fast food franchises, to distinctive panels and architectural fantasies on factories and corporate headquarters. In fact, over two billion square feet of standing seam metal roofing is installed annually, and metal industry projections show that roofing with metal will triple within the next five years. There are a number of reasons why standing seam metal roofing is the most popular choice for residential, commercial, and industrial applications. Metal roofs are durable, corrosion-resistant, fire-retardant, and require minimal maintenance. They are environmentally beneficial, being composed of between 60 to 65% recyclable material, and are very energy efficient. A 1985 study by the Florida Solar Energy Center demonstrated that roofs made of metal absorbed 34% less heat than those roofed in asphalt shingles, and owners who switched to metal roofing reported savings up to 20% on their energy bills. A 2001 study by the Florida Power & Light Company found that a white painted metal roof provided dramatic energy savings as a result of its high reflectance and superior ability to cool at night. 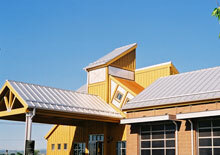 Standing seam metal roofs are designed to perform in extreme high wind conditions. Metal Roof Systems by Drexel structural panels carry a UL 580 Class 90 rating. These panels are also uniquely designed to handle the potentially damaging effects of thermal movement, as the concealed anchor clips used to fasten the panels have a “floating” feature, allowing the panels to expand and contract in response to changes in temperature. Although metal roofs are generally more expensive to install initially, the life cycle cost of metal roofing compares very favorably with traditional roofing alternatives. Unlike asphalt roofs, which require re-roofing approximately every 12- 20 years, metal roofs maintain their good looks and will not decompose. Over time, these roofs will save the owner a lot of money because there is no second investment in roof replacement. In addition to the energy savings noted above, many insurance companies offer substantial discounts to owners with metal roofs, due to the Factory Mutual Class A fire rating. HP Roofing LLC and Drexel Metals Corporation is committed to providing you with quality roofing products at competitive pricing, with the highest level installation expertise and customer care. Dexel offers 4 choice in finish and colors. click links to see a pdf of each chart.